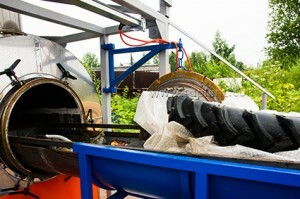 Pyrolysis is defined as thermal conversion process of hydrocarbon waste in the absence of air. The main products resulted from hydrocarbon processing are syngas, liquid oil and solids (char, carbon black, metal). Dry residue is discharged by screw conveyor or rests in the chamber and is removed after cooling. Find more about TDP-2 plant process description.